In anticipation of our Red Rocks show on 6/2, we’ve partnered up with Denver’s Sweet Cow Ice Cream to bring back our favorite flavor – Motet Mocha! Starting now, the first 100 fans to visit a participating location and order a double scoop will grab a #MotetOnTap pint glass! Enter to win VIP Red Rocks tickets + more at select Sweet Cow stores. Details HERE. Motet Mocha is an Ozo Coffee ice cream with chocolate covered espresso beans and a homemade hot fudge swirl. Our flavor will be available at the North Boulder, Louisville, and Stanley Martketplace / Aurora Sweet Cow locations now through May 1st, and the Highlands, Platte Park, and South Boulder locations from May 19 – June 2. 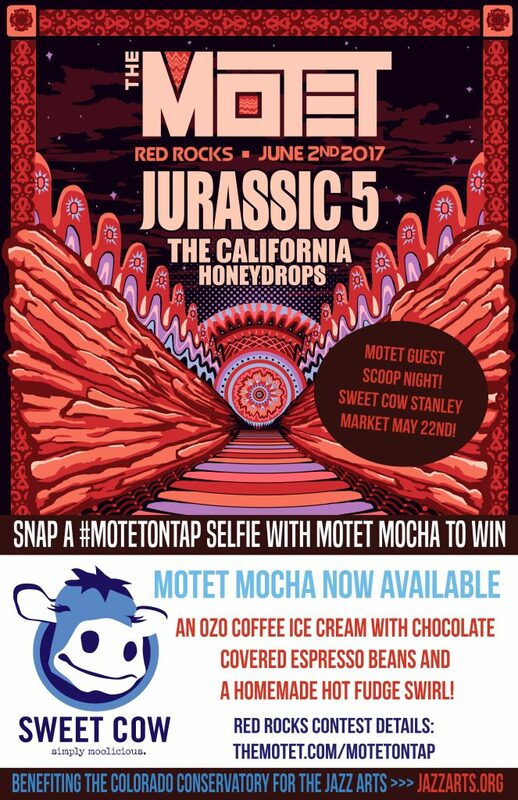 And On May 22nd, members of The Motet will be at the Stanley Marketplace location from 6-8pm, scooping Motet Mocha, with proceeds benefiting Colorado Conservatory for the Jazz Arts (CCJA), who are dedicated to empowering youth to creatively express themselves through the language of jazz! Follow Sweet Cow on Facebook, Instagram, and Twitter.